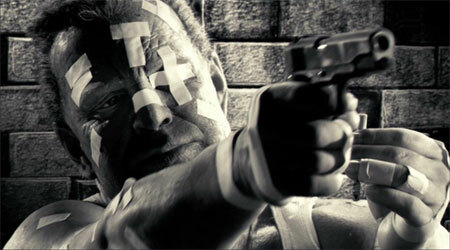 As I said back when it came out, I don’t think I could have not liked Sin City. It was dark and violent, based on a comic book, and directed by Robert Rodriguez, Frank Miller (the creator of the original stories), and Quentin Tarantino? 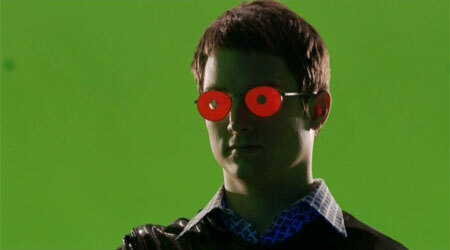 Sure enough I fully enjoyed the pitch black humour and modern noir setting, not to mention the simply awesome all-CGI design that had been started in the likes of Sky Captain but really taken to the next level here with very few props and even many actors in scenes together having never actually met during shooting. Coupled with the mostly-verbatim dialogue it makes it the most faithful comic book adaptation that we’re ever going to see. The cast list is immense, taking in everyone from Bruce Willis and Benicio Del Toro to Mickey Rourke and Jessica Alba, and they universally do a great job of bringing the characters to life. For me the standout is undoubtedly Mickey Rourke as Marv (below), a character who’s actually something of a ruthless monster but manages to come off as a misunderstood and sympathetic figure because of a single night with a girl who looked past his looks. It’s quite a touching story if you disregard the hatchets and torture. I can’t imagine many people really not liking this unless they have a problem with the admittedly copious amounts of violence and the fact that it’s aimed squarely at a young male audience. There are three unique and independent stories within the film so you’re bound to find at least something you like, and the whole presentation is so audacious (both visually and in terms of the flowery prose that characters speak in) that they deserve credit in that respect. Sin City was shot digitally in high definition which means that this DVD transfer has never left the digital domain, so as with CGI animation and the final two Star Wars prequels it’s one of the best you’re going to find. Detail is very high and I didn’t notice any major flaws, which makes this one of the best reference discs to show off what your TV or player can do. It’s a similarly good audio experience with a choice of Dolby Digital 5.1 and DTS (assuming you don’t buy the Canadian version), and although I could only try the DD5.1 track I found it to be fine with a nice range of surround effects and an overall quality that does justice to the excellent music as well. From what I’ve read the DTS is even better. One other audio option, which I’ll drop in here instead of the extras, is a track recorded live at the premiere in Houston, Texas. The sound from the movie in this mix isn’t great (it’s recorded in the same way as a pirated copy, after all) but it’s quite funny to listen to the whoops and cheers at certain moments. If that kind of audience “participation” doesn’t annoy the hell out of you, of course. The big tamale here is the extended cut on the second disc, which splits the movie into the four stories that can be watched separately as if you were reading the individual books. Some moments that have been added in are great and should have been in the theatrical (I really liked the extra Miho at the end of The Big Fat Kill) and some are good in their own right but were rightly cut for pacing, but it’s all worth seeing. Fans of either the film or the books will certainly like to see them if only for curiosity’s sake. Personally I’ll be watching the theatrical version when I feel the need to watch Sin City, but the choice is nice. The extras could fill a review on their own, and most of them have something interesting to say about the production of the movie. The first disc houses the theatrical cut with two commentaries – the first is more anecdotal and features Robert Rodriguez and Frank Miller, and the second is slightly more technical, featuring Robert Rodriguez throughout as well as Quentin Tarantino and Bruce Willis dropping in for their respective parts. Both are well worth listening to although I slightly preferred the first. For video features the first disc has an introduction from Rodriguez; featurettes on the cars, props, make-up, costumes, Tarantino, and Miller; the theatrical trailer and the fantastic teaser; and some weird interactive game that I couldn’t be bothered with. The second disc boasts a similar number of featurettes – a 12-minute (advertised as 15-minute for some reason) flick school with Robert Rodriguez which goes through the processes of shooting digitally and making the movie; an interesting opportunity to watch the whole movie in raw colour green screen format sped up so that you can get through it in ten minutes or so (no sound apart from some choice music from the score); an uninterrupted take of Quentin Tarantino directing his scene which should prove very interesting to anyone with an interest in making films (one of the benefits of digital HD is that even raw footage from the set looks studio quality); fairly entertaining footage of Bruce Willis performing a blues set in a Houston bar during production; and finally a video recipe from Rodriguez for making breakfast tacos that kept him going during those long nights of editing. A pretty comprehensive package without anything that isn’t worth watching at least once, overall. The final extra is a physical one – in the package you get a shrunken copy of the trade paperback of The Hard Goodbye (Marv’s story). It can be a bit small to read but it’s the unabridged version and is an excellent way to compare the movie to the book and see how close they came. Great stuff. To conclude this monster of a review, this is one of the essential DVDs in my opinion. The picture, sound, extras, and of course the movie itself are all excellent, and the package is complete enough to forgive that sin of making a double dip from a bare bones original release. As long as film violence doesn’t bother you this is one of the best movies of 2005 in one of the best DVDs out there.